Sometimes the newspaper (or other Ephemera) that you want to frame isn't as flat as you would like or has ugly wrinkes that you would like to eliminate so it looks better in the frame. Drymounting your page can take care of this. There are pros and cons that you need to be aware of when doing this that I will discuss below. This page addresses drymounting newspapers but can be used for any single page piece of empherma (magazine covers, art, etc). Dry mounting is a permanent mounting process where the art is glued to a mounting board, using heat and pressure. This system of mounting flattens your newspaper to give it a clean look. 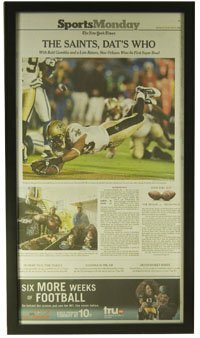 This process is widely used in the framing industry to mount non-archival art such as posters and reproductions. It is not appropriate for archival framing. The mounting board is a foam core board. I use black foam core for this so there is no 'bleed through' of text from the back side. If white foam core is used, you might be able to see some of the text from the back side. The black foam core prevents this. A tissue type adhesive is placed between the art and the mounting board. This combination is then inserted into a vacuum press and heated up to activate the adhesive while the press applies pressure. This process is not reversible. 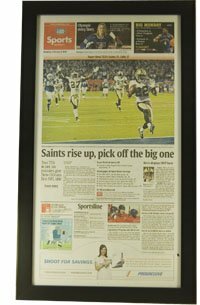 Your newspaper page is permantely mounted to the foam core and cannot be removed. Price The cost to drymount your page is $.50 per UI (United Inch). A United Inch is a framing term that used to size and price framing. It is the width plus the length of the item to be framed. A newspaper that is 12x22" is 34UI and will cost $17.00 to drymount. 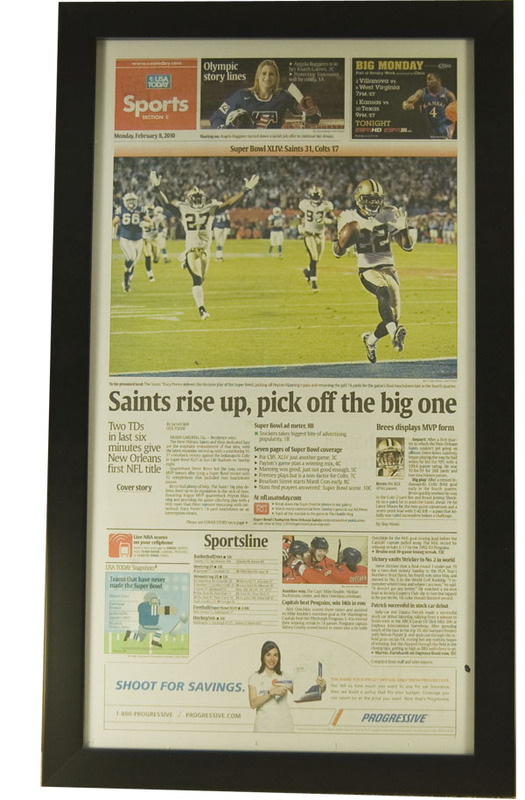 We start with 2 Super Bowl newspapers, USA Today and the NY Times. Neither of them are very flat. This is the equipment that is used for drymounting. It is a Bienfang 4468 Vacuum Press. It uses both heat (190 degrees) and vacuum (28 pounds) to drymount your newspaper. Here we have the two newspaper pages, the foam core and the roll of adhesive tissue that will be used. A piece of tissue will be cut out and placed between the newspaper page and the foam core. A small piece of the paper is heated using a small heating iron to adhere a small portion of the page to the foam core. This is done so the paper won't move when the vacuum is drawn out of the press. The newspaper, foam core and adhesive tissue is placed in the press which is pre-heated to 190 degrees. The press is closed, started, and vacuum of 28 pounds is applied. After 5 minutes, the press is shut down, opened and you can see the results in this image. You can see here that the final result is a perfectly flat page. All that remains is to trim the edges. Another view of the flat page after it has been trimmed. The framed NY Times page. 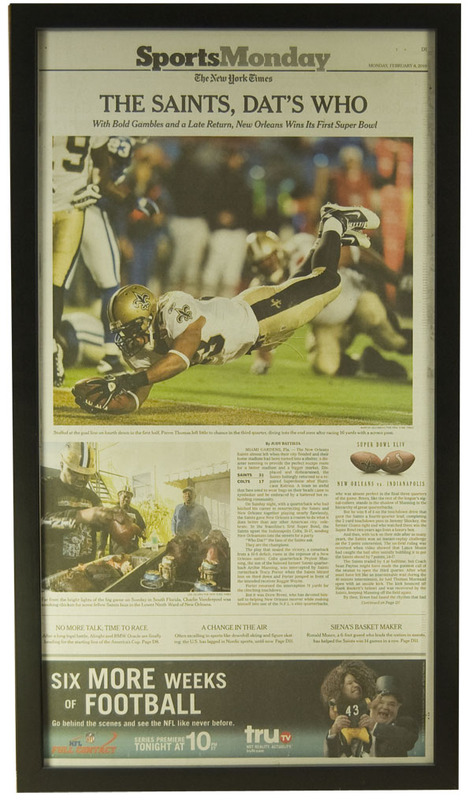 The framed USA Today page.